In a perfect world, we would all live in homes that are blessed with a perfect mix of natural and artificial light. Lighting makes all the difference when it comes to creating a well balanced and harmonious domestic interior. It's all well and good to remodel your quarters with fabulous new colour schemes, paintwork and a suite of fresh furniture, but unless you take care of your lighting situation too, all that good remodelling work could be in vain. Lighting is especially crucial when it comes to the living room. Of course, there's no substituting a comfortable couch or settee when it comes to relaxation, which is essentially what the living quarters ought to offer. However, there's a difference between basic comfort, and the right mood and vibe to go with it: lighting helps create the 'feel' and 'tone' of a living room, enhancing the comfort level that your furniture and other accessories should be covering. The question then is: what sort of lighting works best? Today on homify, we're helping you choose the perfect selection of lighting for your living room, with a look at the range, styles and qualities of lighting on offer. When it comes to lighting, there's a lot more to it than merely selecting a lampshade and globe and affixing it to a given wall or ceiling area. Before that happens, there's another choice that you really ought to consider: the quality of your lighting. You may have heard about different interior lighting qualities, two of which are direct and indirect light. Indirect light can be great for the living room because it tends to induce a soft, unobtrusive environment, enhancing a mood of relaxation and ease. The understated warmth of indirect light can be extra flattering for social occasions as it can create a sultry and sensual mood, though on the other hand, it can make it a little more difficult to make out specific details of objects and furniture in a room. Here, we see a neat example of indirect light at work: soft, reflective and warming—very unobtrusive and gentle on the eye. Choosing the right lighting for your unique spaces can be a difficult task—it's always a great idea to get some additional advice, so why not talk to a professional today? It doesn't matter what sort of living space you have, ceiling lamps are a go-to favourite for inducing a cosy, warm and inviting living room mood. Whether your spaces are large and cavernous, or petite and compact, ceiling-affixed lamps and lampshades can really work wonders to bathe your living quarters in fabulous lighting. 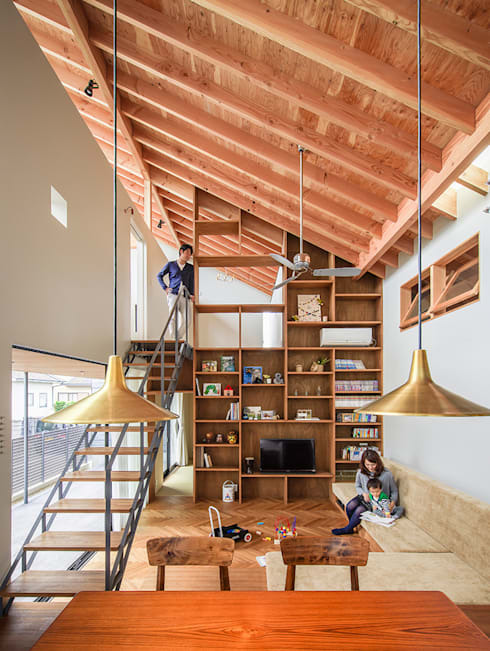 Here's a brilliant case in point: an open, airy living room space with a loft-style addition that works to perfection with the installation of two gold funnel ceiling lamps. While we don't see the light at work here as such, given that it's daytime, we can easily imagine the warmth and invitation that emanates from these lamps after nightfall. We talked earlier about the virtues of indirect lighting for inducing a warm and inviting living room mood, and while that choice remains a great selection, by no means should you avoid the alternative. Direct light is fantastic when you want something energy effective that also creates an attractive, slightly bolder and more vivid environment. 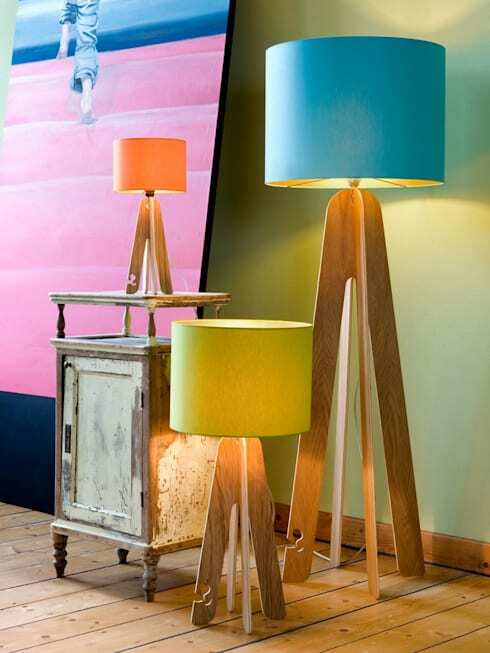 Sure, if you're not careful, direct light can be rather obtrusive and unflattering if it's too harsh, but with the right selection of lampshades, good placement and room consideration, direct lighting can be a great way to illuminate your space. In this fine example, we see the power of direct light to make a room shine with just as much warmth and allure as indirect light: lampshades poised over an artistically designed seating area give excellent illumination, without being too abrasive. As well as quality, it's always a good idea to open up your eyes to range and selection of lighting colours and tones available. 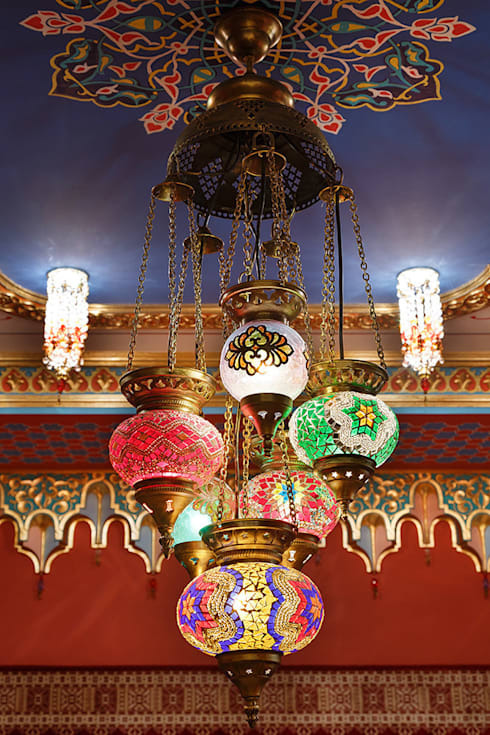 Colour has, throughout the styles of the decades and centuries, been used to full effect for inducing special, unique and exotic flavours: from carnivals and circuses, to casinos and hotels, to more Middle Eastern, Persian and Moroccan styles. This goes for lampshades and fittings, just as much as the light bulbs themselves. 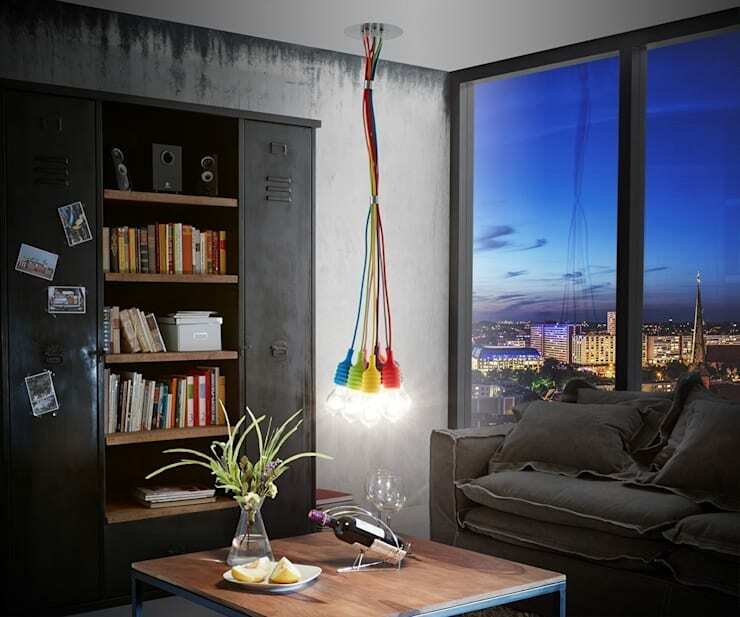 While it might not suit every home to install a fabulously audacious, yet compellingly inviting, set of Russian-style hanging lamps such as the ones in this vibrant example, it's certainly a fine comment on what's possible. Used in small doses, perhaps, with a bit of imagination to go with it, consider how colourful lighting and accessories could be implemented in your living spaces. It just might give your room that perfect blend of warmth and flair. Tabletop or not to tabletop? While quality of light ought to be a prime consideration at the start of your living room lighting overhaul, just as important is the actual construction and style of your lighting choices. By this, we mean the logistics: where exactly will your lighting sit? Will it sit, will it stand, or is it better to install and embed it as part of the walls or ceiling? 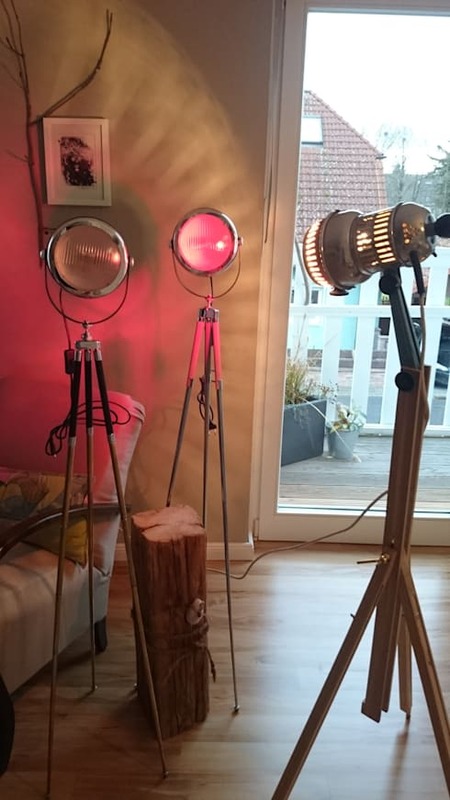 The latter option can be expensive and cumbersome, so for many of us, placing some neat lamps around our living room will be the most accessible and expedient choice. 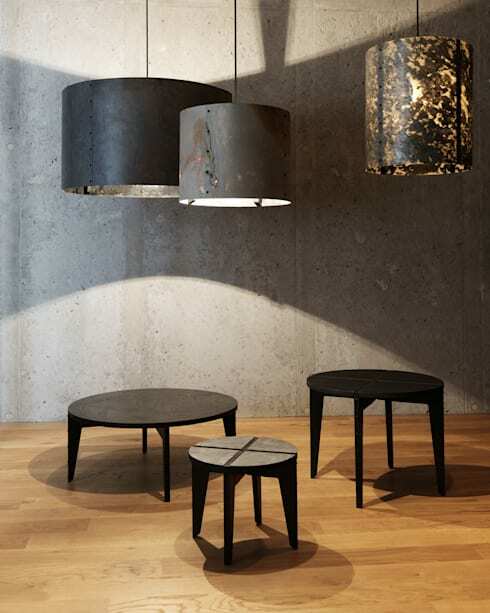 Then, the question is whether to go for floor-based lamps, or surface-based ones. Table- and surface-top lamps are fantastic for inducing a warming, relaxed and more private mood, and can easily be placed around the room as needed. Ultimately, it's your decision when it comes to lighting up your living quarters, and there's no reason why you should stick to traditional convention. Consider implementing some unique and interesting lighting designs to spice up your living quarters and make them really appealing. This fabulously artistic, yet simple, collusion of intertwined lamps bring so much zest and verve to this modern high rise living space: the light is bright, bold and very direct, the connections fabulously rainbow-toned, and yet the room is made to feel effortlessly cosy and inviting. Did you like that Ideabook? 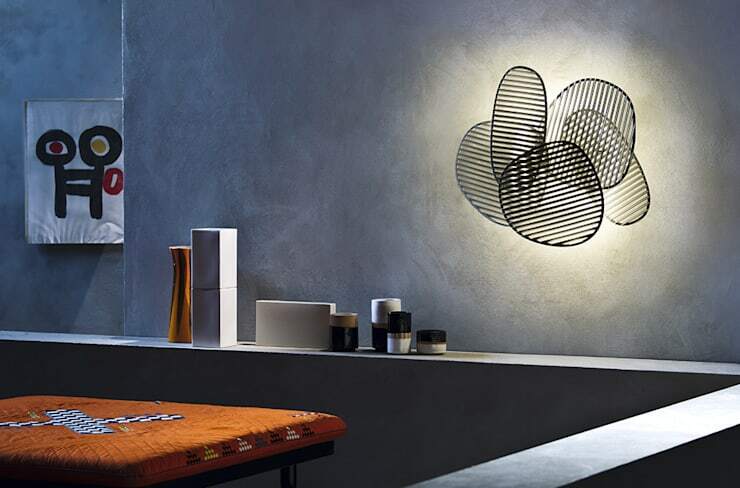 Why not discover some more bright ideas with a look at Lighting that begs to be noticed. Of course, there are pros and cons to each: if surface-based lamps are too limiting or not to your personal taste, floor-based lamps are an equally great option where the room demands something a little more versatile. Floor-based lighting tends to give greater light overall, with fine illumination in lieu of a wall or ceiling installation. However, sometimes their benefit comes in the form of being more of a room feature or statement. These pink-toned tripod lamps offer a stunningly different treatment to this modern living room: contemporary, artistic and no less warming or inviting. Do you have any other great lighting tips for our readers? We’d love to hear from you in the comments section below!